Alessandro and I took a walk along the Arno this evening. He wanted to take a passeggiata (stroll) around town to enjoy the evening while I wanted to take some foto (pictures). From via dei Leoni, we walked through the Palazzo Vecchio, which is now open on all four sides of the building, and exited on the other side to arrive in Piazza della Signoria. The streets were crowded, but the weather was so wonderful that it was a joy to be outside. The sun was shining and keeping us warm, while a cool breeze blew past us. 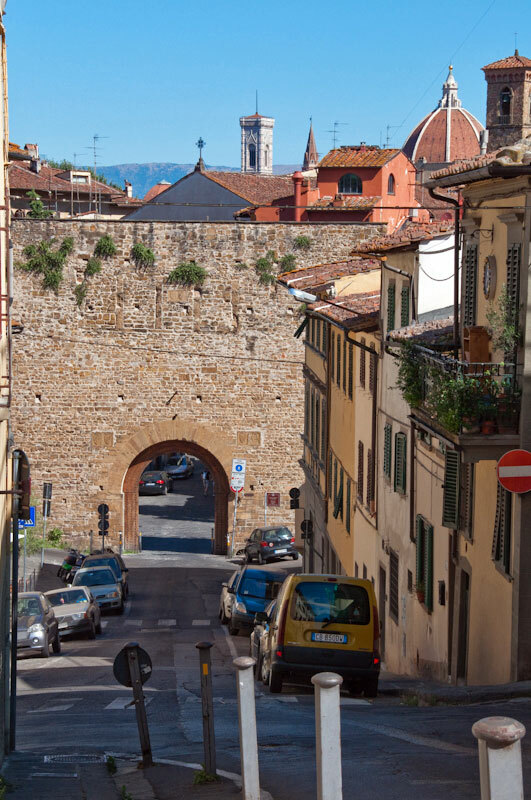 During my walk this morning, I didn�t march through the crowds of tourists past the view of my beloved city from Piazzale Michelangiolo, but instead stopped at each of the corners of the piazzale to take in Florence. My morning walks seem to be the only time I get to contemplate my beloved city, and today I didn�t have to be anywhere so I stood at the railing to take in the beauty of my city. This morning when I woke up, I was happy to see the clear blue sky. Because of the cool winds that have been blowing since yesterday, the smog has lessened, making the colors in the city even more vibrant. For at least a month, I hadn�t been taking any foto (photos). Besides the heat, the colors were also muted and didn�t inspire me much. I also like to enjoy the city without carting my macchina fotografica (camera) around so I can just take in the city without thinking about what would make a good foto. On my walk to Piazzale Michelangiolo today, I decided to carry my macchina fotografica with me so I could take some foto now that the brilliant colors of the city have returned. For the second Saturday in a row, the weather is a bit cooler thanks to sparse clouds and refreshing winds. Fortunately for me, it has allowed me to go for a longer run along the Arno. The weekends are always more pleasant for me anyway because of the lower number of cars and motorini (scooters) whizzing next to me. Early in the morning there are generally fewer people walking, so it�s even easier to navigate the cobblestone marciapiede (sidewalk). The cooler weather also allows me to run farther because the heavy, humid air tires me out and makes it difficult for me to run farther. On my walk this morning down lungarno (the street along the Arno), I crossed paths with a few people walking toward the centro (center of the city) with their macchine fotografiche (cameras) dangling around their necks or tightly held in their hands. I hope they take a few amazing foto (photos) that they can cherish when they return home. 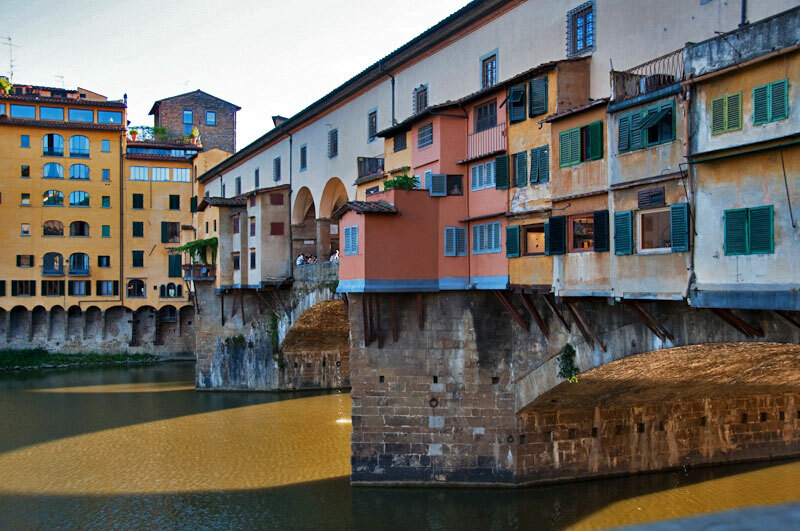 Generally people tend to visit Florence for a short period of time and I always wonder if they�ll stick to the main attractions or venture out and let the beauty of the city inspire them. Even after living here for many years, I still continue to discover more even when I�m not out visiting things specifically, so I wish them the same on their journeys here. Today I went to a small restaurant near my apartment to have lunch by myself. It�s not something I do often, but I enjoy it greatly. I�m never really alone since I always have with me a book, a notebook, and a pen. I started out by reading my book while I waited for my lunch to arrive, but after a few pages I put it down. The writer in me craved for some time to write while my mind was quiet and there weren�t any distractions like work, phone, people, or email. After many cool and rainy days this summer, the heat has arrived and bought with it high humidity. Being from California, I love the seasons and welcome the hot weather. However, it does take some getting used to because it can be a little overwhelming at the beginning. When we have time and want to cool off, we either go to the montagne (mountains) or to the mare (seaside), but if we don't have that much time, we try to escape the city if just for a few hours. Each time I get to use my Amici degli Uffizi card, I feel so fortunate. I had been wanting to visit the Bargello National Museum again because it has been a while since I popped in for a visit. It makes me so happy to walk a few minutes from our apartment and enter my favorite museo (museum). I stroll by it quite often and always peer in the tall glass windows to take a peek at the courtyard and statues.